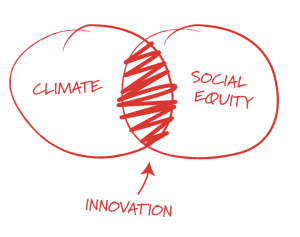 The TRANSFORM: Climate, Communities, Capital Gathering is the centerpiece of an always-on convening that includes labs, working groups, and editorial content. Transforming climate, communities, and capital to create a safer, regenerative, more just world is the context for a deep focus on HOW to accelerate these changes. Transformation requires a fundamentally different mindset and gameplan than sustainability. TRANSFORM equips systems entrepreneurs to move faster, with more confidence. REAL community through connection and inspiration. This gathering is explicitly designed to facilitate connection between members of the community with the goal of driving collaborations, partnerships and action. AND we keep the conversation going after the physical gathering through our TRANSFORM newsletter, labs, follow-on events, and more. Confirmed organizations attending and speaking include Tides Foundation, ImpactAssets, RSF Social Finance, Ejido Verde, Regenerate Illinois, The New School, Adaptive Edge, Carol Sanford Institute, Reporting 3.0, Innovation Collective, WeFunder, the REgen Network, Association for Enterprise Opportunity, Amalgamated Bank and many others.